Passengers aboard new hovercraft stay safe thanks to custom electric bolts. 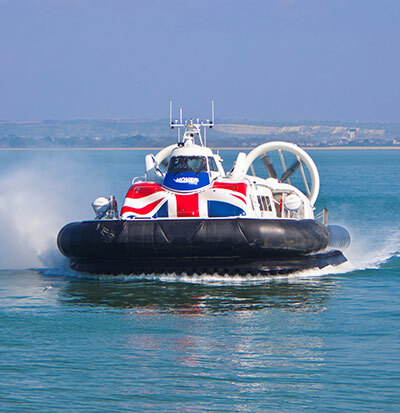 In July 2016, Southampton-based Hovertravel introduced an all-new passenger hovercraft on its popular route from Portsmouth to Ryde on the Isle of Wight. 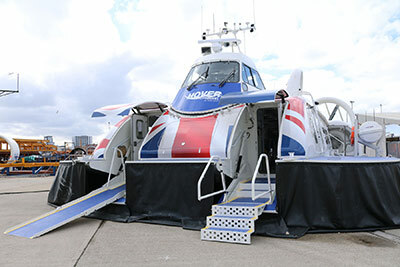 The vessel is unusual in one specific way: it is the first commercial hovercraft to allow ‘forward passenger access’ via two over-the-bow ramps. This payload access configuration has previously been the sole preserve of military hovercraft. 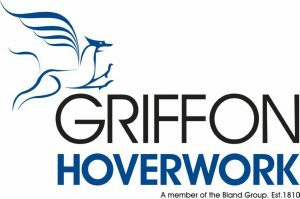 That convenient and easy access was partly made possible by a unique collaboration between manufacturer Griffon Hoverwork Ltd and the UK’s leading solenoid design company, Magnet Schultz Ltd.
Griffon Hoverwork has been at the forefront of hovercraft operation and manufacture since these innovative vessels were first conceived over 50 years ago. Thanks to its excellence in amphibious engineering, the company currently supports more than 200 active craft in 41 countries across the globe. In January 2016, Griffon sea-trialled its newest model, the 1200TD (TD stands for Turbo Diesel). The foundations of the 1200TD’s competence lie in the new technologies deployed and production quality improvements. As a result, it is a ground-breaking new model and the most technically advanced modern hovercraft available. Among the new technology endeavours at the heart of the vessel’s design was the proposition to deploy twin access ramps over the bow, and all that would entail. As the first such design to be submitted for approval to the Maritime and Coastguard Agency, the governing marine safety body, the ramp locking mechanics would have to meet stringent criteria. In hovercraft, the access doors must be under the sole control of the pilot. Therefore, the pilot decides when it’s safe to unlock the doors and hatches; only then can the cabin crew open the access ways and lower the ramps and steps. Security, safety and craft integrity at sea dictate that the doors remain locked. But that they can be quickly unlocked by the pilot remotely and reliably. That locking system demands a special grade of mechanism to meet the stringent maritime regulations, as well as further consideration to cope with the harsh environmental conditions encountered with a fast vessel at sea; saltwater spray is especially challenging to electrical systems and moving mechanical components. In the development phase of the Model 1200TD, the designers chose to enlist the expertise of a business partner specialising in electromechanical locking systems. Initial meetings took place in January 2015. Electrical Design Team leader Paul Newton and his engineering team at Griffon engaged with three companies. A comprehensive review process scrutinised each contender’s industry reputation, product build quality, knowledge base and experience in the marine sector, and – critically – the company’s ability to adapt its expertise to the distinctive hovercraft application. So how does a test for durability work? “By studying the build quality of samples, we can tell,” says Newton. “We know what survives well in our environment: stainless steel housings, marinised engineering, robust seals and special surface finishes. Components used in harsh automotive or industrial settings would not survive; this is another level of harsh: salt would soon cause corrosion.” The outcome was positive for Magnet Schultz Ltd, a Surrey-based business (referred to in the industry as MSL) considered a world leader in the development and application of solenoid technology. MSL won the design contract. Through its German parent corporation, MSL has unique access to the precision-engineered solenoids, actuators and ancillary products – the ‘raw materials’ used at the core of MSL’s value-added subassembly design and manufacturing service. The company produces bespoke locking and actuator solutions across a range of market sectors from security, aerospace and access control to transport, industrial and marine. One such collaboration defined the length of stroke for the electric bolt design. The longer the stroke requirement, the less precise the lateral positioning of the ramp would need to be, as it moves up and down inside the bow. “We needed to know the lateral movement, as we wanted to make everyone’s life easier from the outset,” says Sam. MSL engineers developed an exceptionally long 50mm actuator stroke but found that the trade-off was not worth the risk. Instead, a 35mm throw proved ideal to bridge the gap with a slight redesign of the bow ramp. “We had early issues with misalignment due to some flex in the hull, which we were able to resolve through re-engineering,” explains Newton. The MSL design team reduced the module size and configured it to fit the mounting space inside the craft. Despite the smaller component dimensions, the team could use Power Control technology, thanks to the plentiful power budget aboard the hovercraft. This easily delivered the energy for a hard start DC pulse then a power drop to drive and hold, enabling a reliable 35mm long throw. Other development cycles addressed the harsh working conditions the products would encounter. The MSL design team began its project with one of its industry-proven products, the EBL-I open frame electric bolt module, and set about marinising it. The goal was to increase conformity to IP65 rating. The result was an exceptional new concept that prevents moisture passing down the bolt to the inside. “Some seepage past an external lip-seal must be accepted,” explains Sam. So, his team invented a ‘wet’ chamber separated from the electronics by a shaft and rotary seal. A duck bill seal is deployed between the chamber and the outside world. “When water gets in, you need to let it out,” says Sam. The new chamber technology does exactly that. As the bolt retracts, the volume in the ‘wet’ chamber reduces, increasing the pressure within; this forces the water out through the one-way duck bill seal. “Even after an intense wash-down, an actuator cycle will expel any water ingress,” Sam claims. Orders for the electric bolts were placed by Griffon at the end of May 2015 while the ramp mechanism was still under development. Initially, the hovercraft design team planned to have the ramps rest on the locking pins of the electric bolts when closed. “We had productive and honest discussions resulting from the great relationship we forged with the MSL team about a design that saw the ramp rest on the electric bolts,” explains Newton. MSL expertise quickly guided the thinking. Side loading of an electric bolt pin is an additional force that the mechanism must overcome. “It may reduce dependability of the actuation and would certainly increase the rate of wear,” explains Sam. The original Griffon design called for four electric bolts, with a pair for each ramp as a failsafe. But MCA safety requirements permitted the installation of just one per ramp, which saves weight. The revised access design has the ramp locking to the electronic drive ram, which itself locks. Each electric bolt is therefore both a failsafe and a remote-control access feature that meets MCA certification criteria, with no mass resting on the actuator pins to impede performance. Should a locking mechanism fail, the hovercraft must be grounded as it no longer meets the passenger safety regulations. With the initial procurement based on two bolts per ramp, an unplanned advantage arose in that Griffon now has the redundant electric bolts as spares; these can be installed quickly in the event of a failure to keep the craft in service. To date, there have been no failures. The electric bolts are performing faultlessly, coping with large volumes of salt water spray and enduring regular wash-downs.